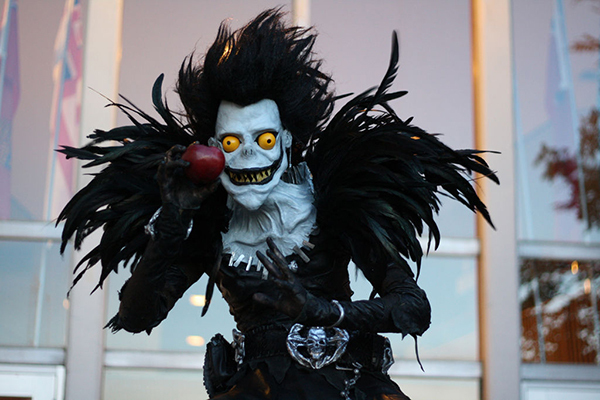 Ryuk Costume Looks To Be Just the Right Amount of Zany « Adafruit Industries – Makers, hackers, artists, designers and engineers! The leather outfit was made of over 80 pieces of leather patch-worked together. I used an old ill-fitting trenchcoat, bought a few coats from Value Village and was given an old pair of pants from my brother in law. 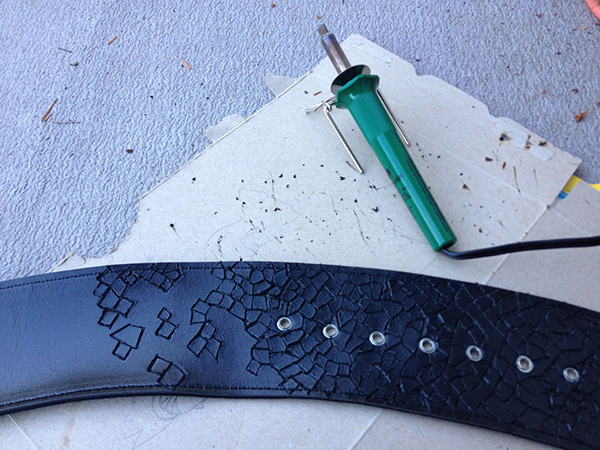 I took them all *completely* apart, so I was left with (mainly) rectangular pieces of leather. Individual pieces were drafted and cut out, given texture with a wood-burning tool and sewn to other pieces. Zippers, grommets, studs and cords adorned the pieces, along with kneepads and a spine (both of which were formed by soaking leather in water and leaving them around light bulbs and an ice cube tray).